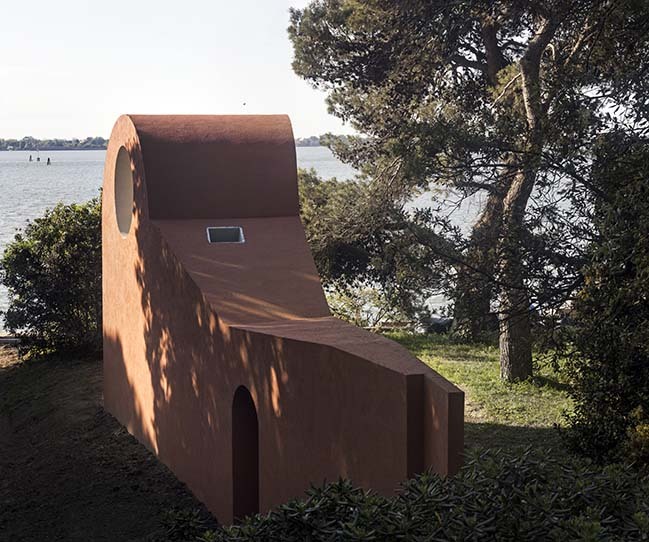 The Morning Chapel by Flores & Prats is one of 10 chapels constructed by international selection of architects for the Vatican Chapels project, curated by Francesco Dal Co as part of La Biennale di Venezia 2018. An island - To be on an island and then inside a garden, allows a state of being where one’s mind can drift to a peaceful place of reflection. 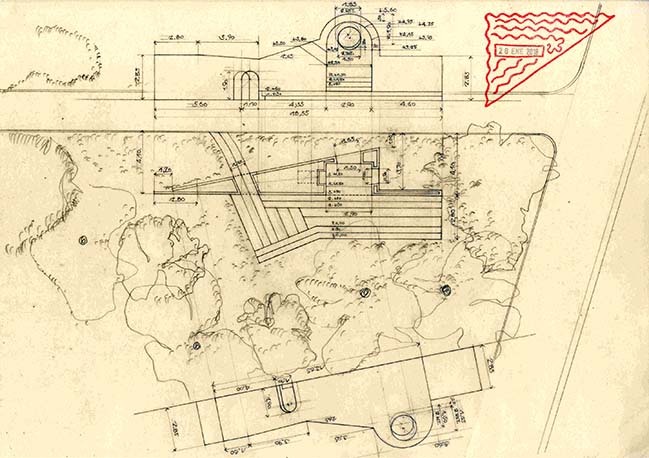 The garden in San Giorgio has a fan structure of walks, starting from Palladio’s Cloister towards the Lagoon. The Morning Chapel is along one of these long paths, and sits right before this walking line meets the water. 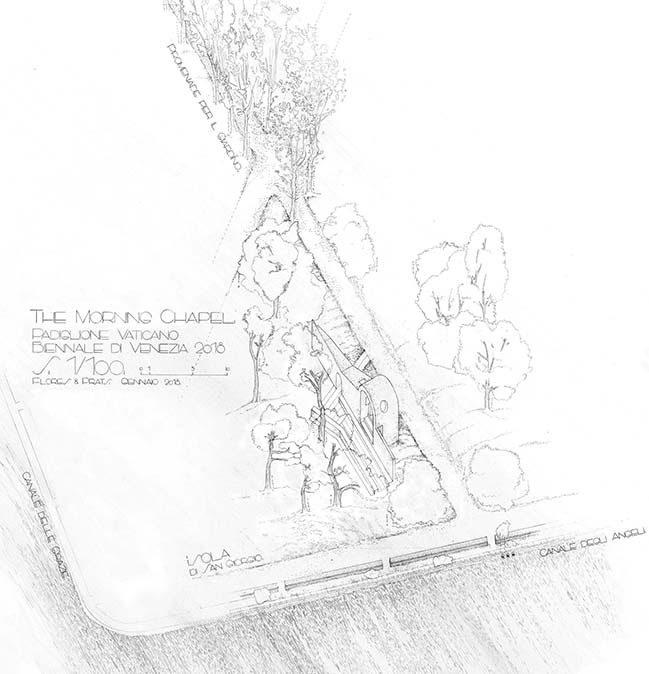 The forest - The chapel is presented as a wall parallel to the path. This wall has a door, offering the option to step aside from the common route and move into the forest, abandoning the known destiny offered by these lineal paths in favour of the unknown, at risk of disorientation. 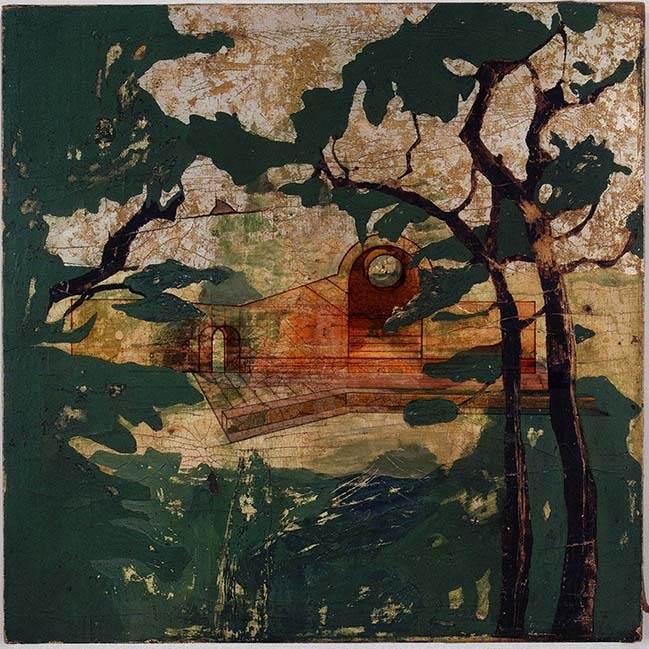 The chapel becomes a door to the forest, to the grander entity to which it belongs: a natural dome made out of the adjacency of tree branches. 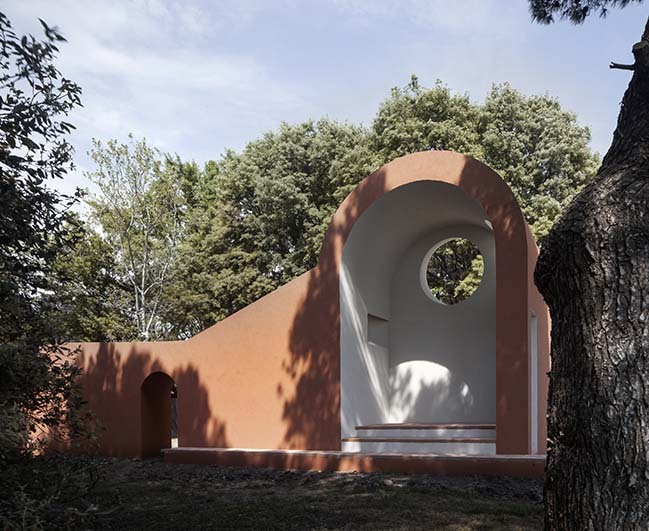 The fragmentary condition of the chapel is thus complemented by the pine forest, and borrows its natural qualities from the trees in it: the smell, the fresh air, the noises and the light. Both elements, built and vegetal, form a natural clearance that embraces the visitor and creates a place to stay. It is a change of rhythm, a change of breath. Early morning - The chosen site is at the eastern part of the island, where the morning starts and the chapel can catch the first sun of the day. 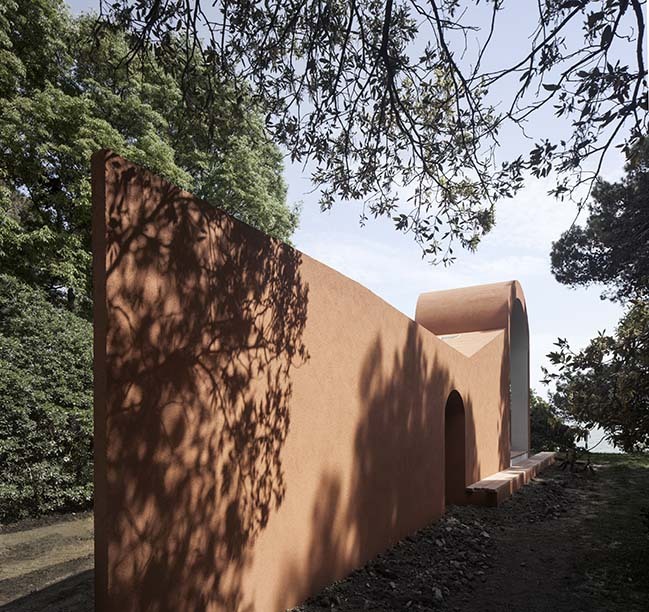 This chapel is an early morning place, where the first sunlight becomes visible through a ray of light that trespasses a circular hole in its wall. 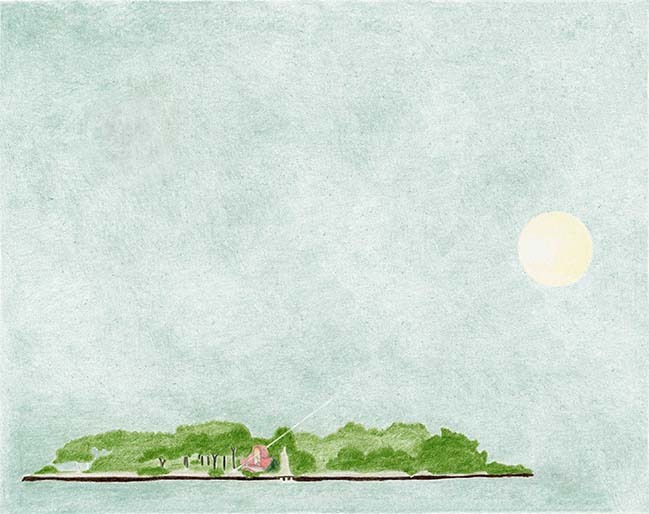 The Morning Chapel, catching the sunlight on its walls, and the island forest, a continuous canopy in darkness, together establish a quiet place, an invitation to sit alone or in a group. 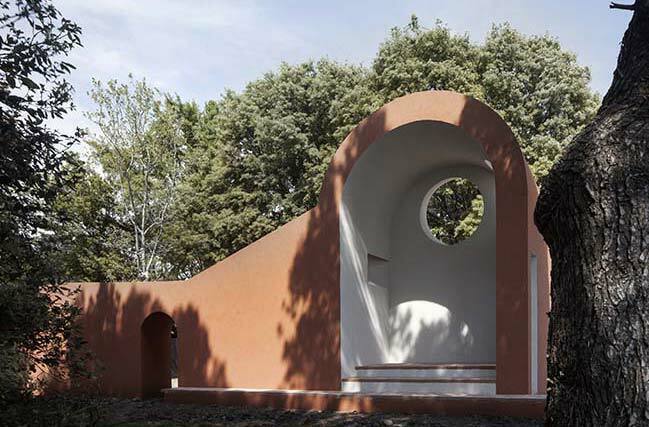 Compactness - The chapel is thought of as an excavation in a wall, a chamber in its thickness opened to one side, containing levels and light, a place to sit protected from the sun and the rain. It is a compact construction with a continuous surface, to avoid expressing its building details, favouring instead its solid, primitive aspect. This antique condition of its form and finishing makes it something in between a forgotten fragment from a previous construction and an open chapel from the beginning. It moves between memories of the ruins at Villa Adriana to the open chapels of Latin-America. Meeting - Once there, one is confronted with the same end that the lineal walk was leading to. 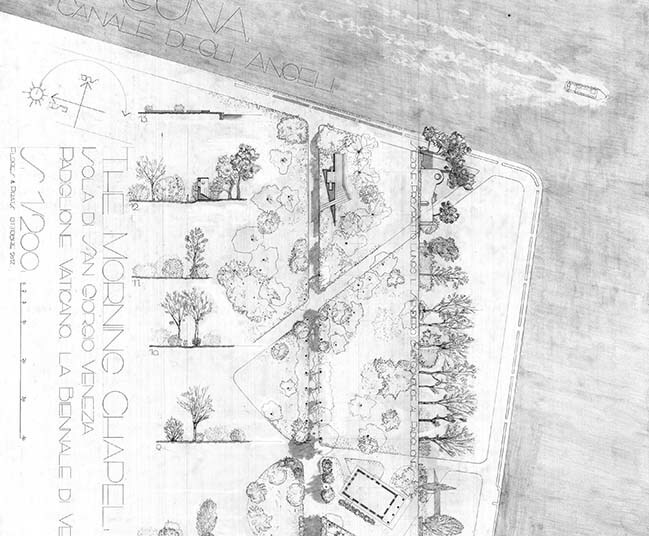 The difference is that The Morning Chapel builds another perspective and a meeting place. Its open condition welcomes all kinds of visitors this side of Venice, not imposing a precise meeting position but allowing a variation of encounters. Sitting in this place there is a double focus of attention: one towards the edge of the island and the Lagoon; the other at the casual nature of people meeting around, all having arrived there due to magnetism of the Venice Biennale, sharing a common curiosity, a coincidence to celebrate.